For me, Lincolnshire has always been a Garden of Eden: a terrain full to the brim with enchanting tales and breathtaking scenery which is hidden away behind the veil of metropolitan society. Many stories I had been told of patchwork meadows, quirky foods and Iron Age settlements. I never once dared to transcend this barrier between dream and reality until I was offered the chance to visit Lincolnshire for the first time. The first day began with arduous car trip all the way from the Dorset coast. As we entered Lincolnshire, the land became pristinely flat with the rolling hills like a palette of colour. We had set off in the early hours of the morning, when the sky was aflame with glorious sunrise. Therefore, we were in need of a good breakfast to kickstart us for the day ahead. We stopped at a local farm shop and enjoyed a basic fry up. Unadorned yet deeply flavoursome, the breakfast had me back into a fit and zealous mentality. Our first stop was to Tealby, a picturesque village enclosed by a lining of conifers in the heart of the Lincolnshire Wolds. As we approached our accommodation, smells of manure to pollen passed through me like a chainsaw through frogspawn. Even from our accommodation, I could see the cattle grazing over the flat plains and the rows of agricultural crops. Our accommodation was a quaint cottage with traditional interior. I would have liked to have relaxed in the armchair in the sitting room but we were soon off to explore. 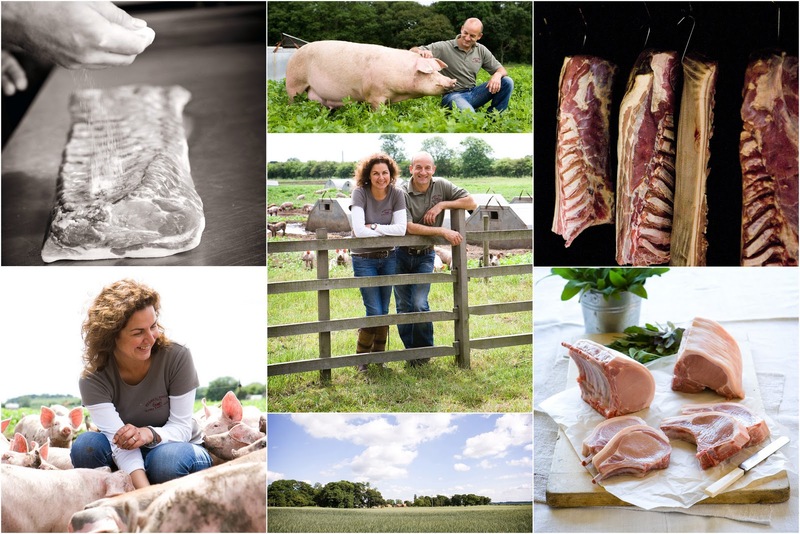 Redhill Farm are producers of national award winning free range pork, using traditional, simple methods to produce fine quality fresh pork on the farm from their own herd. Named after the farm itself, the business started in 1998 when Jane Tomlinson diversified her husband Terry’s farming business in response to the growing need for high quality local produce. As we basked in the sun, Jane came out to give us a tour of her farm. Instantly, her dedication to local food as well as her gregarious nature became clear. Approaching the smokery, the aroma of mingling spices created a surge of appetite within me. I found it incredible to see just how pigs are bred and the strong ethic behind the whole operation. We saw pigs, all with their own huts, rolling around in a pool of mud, suckling their piglets and enjoying their carefree lifestyles. Personally, I find pork a difficult ingredient to cook perfectly as many distributors can lie about origin. Jane’s quality assurance at every stage was meaningful to me and I can see why Redhill farm is known as ‘the stall with the queue’. These pigs had their sweltered faces soused by cool drinking water, their hunger fed by an assortment of feed and their desire for care tended to by Jane and her family. As she presented me with a hamper, bursting with Lincolnshire specialties, it was a true culinary and personal delight. Moisture clung to my burn flesh as I stood waiting to leave so I decided to sit by the car and focus in on an oak leaf, imposing me into its shade. The sky was of so delicate a blue as to contain something of gently mockery. There was no wind so the lone leaf sidled on its going downwards and touched at last so intangibly the earth with which it was to merge, that the gesture was much gentler than the greeting. The car engine roaring into gear brought me back to myself. With the taste of salty bacon marring my tongue, we headed for Uncle Henry’s farm shop. Based around 5 miles away from the centre of Gainsborough, Uncle Henry’s is a secluded farm and coffee shop named after Henry Wright. Today, the farm is mixed arable and livestock farm growing many crops and has a large pig herd. The farm aims to promote environmentally responsible farming. In the shop, we saw an array of local produce ranging from pork haslets to stacks of idiosyncratic cheeses to the infamous cauliflower. Everywhere I looked; this shop was championing everything from Lincolnshire and delivered a strong ethical message again. All of us salivating, we picked out some goodies such as a locally sourced grape pressé and cured slices of bacon, directly from the farm. Around the shop, zesty perfumes and meaty aromas tainted the air, arousing fervent wonder on my palette. As the sunset began to dominate the surroundings, stars studded the sky and I was surrounded by colour that looked like spots of jam, splashed across the sky. We headed through the narrow streets, past the blistering paint and gilt of once bright murals into the centre of Louth, to ‘Melanie’s’, a contemporary restaurant serving local produce at its finest. I ordered the ambitious main of fillet steak in a red wine jus which didn’t fail to deliver in any sense. The beef flaked under my fork, melting slowly into a warm sensation in my mouth. The tang of the red wine added a different dimension with the steamed vegetables, ever so slightly adding a softer and warmer texture to the dish. Overall, my beef along with the duck and sea bass the rest of my family enjoyed, proved food can be of paramount quality without having travelled from the iridescent shores of Denmark. As the night drew in, we promenaded under the stars which proved a psychedelic phenomenon piercing through the silence of the darkness. We made our way back to the cottage and lit the fire. Its orange and red tendrils explored the fireplace like a new born’s hand, and with the fire crackling gently, I slipped into sleep on my capacious bed. As I woke up on the second day, I saw the sky ushering in a gray and forbidding manner. We decided to explore Lincoln, and set out after a warming breakfast of delicately smoked bacon, gently caramelised sausage and softly fried egg, all donated by Red hill farm. As we left the enchanting hills of Tealby, the land opened up once again, creating a natural pathway to our destination: the Iron Age settlement of Lincoln. The heart of this fruitful county is a place full of chic retail and beautiful architecture with historic and mysterious tales pumping through its veins. Walking down the streets, I caught the smells of griddling sausages and rubbed orange peel, among the multitude of sounds. Despite being of Iron Age origin, the town is sculpted around the Tudor era which adds to the quirky charm of the place. Whilst we had to leave to head back home, sitting under the voluminous facade of the cathedral was enough the sear your inner marrow with wonder. Overall, the trip to Lincolnshire was a real dive into an unknown pool of agricultural and culinary discovery. I not only learnt about the capricious consumer view on local food but the trip was also a personal development for me as a young cook/writer. Whether I am need of inspiration for Watz4Dinner or creative flare, a euphoric shiver will always race through and vitalise me, taking me away to Lincolnshire: land of blue skies and Lincolnshire pies. This month our guest blog was written by Ryan Gruss; winner of the Guild of Food Writers WriteIt competition 2010 and author of the Watz4Dinner blog. As the Tastes of Lincolnshire team are busy preparing for the Sausage Festival at the weekend, we thought it would be a good idea to raise the profile of the protected status of the Lincolnshire Sausage, especially as we're also fast approaching British Sausage Week too! Don't miss our Tastes of Lincolnshire BIG Sausage Festival on Saturday 30th October from 10am to 4pm in Lincoln Castle and Castle Square, Lincoln. It's free and there's lots of entertainment and of course lots of sausages and local produce to sample! Jane Tomlinson, Director of Redhill Farm Free Range Pork, farms in Lincolnshire with her husband Terry. As well as running the business, Jane has three children and is founder of Lincolnshire Farmer’s Markets, a founder member of Tastes of Lincolnshire, an Ambassador for Select Lincolnshire and a SlowFood member. Here she discusses the not so humble Lincolnshire sausage. Sausages are serious business! Just over £650 million was spent on sausages last year and the figure is rising.That is equivalent to nearly £30 per household. No wonder there has been a lot of attention lately in the progress of the application for Protected Status for the Lincolnshire Sausage. If it wasn’t such big business Lincolnshire Sausage would already have it’s protected status – as ever it all comes back to money. The issue here isn’t why should Lincolnshire Sausages be awarded protected status – I think we all agree that it’s a regional speciality originating from our county. All genuine producers of Lincolnshire sausages with a connection to the county have agreed that their own secret methods are fundamentally the same. (ie: The agreed specification is 70% minimum pork coarsely ground open texture, breadcrumb or bread rusk, sage, seasoning and natural casings). The only stumbling block is that if Lincolnshire sausages get Protected Geographical Indication (PGI) this means that ALL Lincolnshire Sausages have to be Produced or Processed or Prepared in Lincolnshire. That in itself isn’t much to ask. I would have preferred we insisted on the PDO status (Protected Designation of Origin) where all three have to be carried out in Lincolnshire – but apparently that isn’t even remotely viable – so we’re not insisting that the pork and other ingredients have to be produced in Lincolnshire, or even the UK, that means we are even allowing our county sausages to be made with imported pork by some big companies that supply the vast majority of sausages sold by the multiples outside the county. You won’t catch any self-respecting Lincolnshire butcher touching the stuff I might add. No, all we are asking is that whoever you are, however big and whoever you supply, with ingredients from whereever, is just that you make them in Lincolnshire. Most producers could commit to that you would think, even the multi-million pound processor or supermarket chain – they should at least be made to have a processing facility within Lincolnshire – rewarding the county of Lincolnshire with jobs and industry and the knock-on effect that this boost to the local economy would bring. In an ideal world if we had PDO status and the pork and other main ingredients had to come from the county that would benefit the whole industry supply chain of farmers, growers, slaughterhouses, butchers, processors, packers and distributors. Last time I looked there seemed to be plenty of empty industrial units and sites to develop and I’m sure we have a few people unemployed to fill the jobs. Just for once when we have an opportunity like this, when we have something unique in this county, something which is very rare in this world of globalised, homogenised food production, would it seem too much to ask that the county that has this regional heritage actually gets some benefit from it? Something many people may not be aware of is that in many other counties in the UK they have lost their small independent butchers shops to bigger “chain” butchers. These businesses operate in the same way as the supermarkets – having central production and distribution depots churning out the same standardised products to all outlets regardless of region. Lincolnshire as a county is an exception in this respect having many generation family butchers due to the deep rooted rural connections with farming and the service that these family butchers provided in our historical market towns.These butchers are still providing that vital link now, keeping skills alive and offering REAL locally reared meats and producing something of quality for those that value it.These butchers and other specialist producers like them are very proud of their heritage and the Lincolnshire Sausage. So that’s it, the issue is that big businesses don’t want to move into Lincolnshire to be able to produce Lincolnshire sausages. We’re not fighting EU opinion over whether the Lincolnshire sausage fits the criteria for protected status – of course it does! We’re not going to be lining the pockets of the vast majority of small independent producers of Lincolnshire Sausages anyway – most of us mainly sell locally within Lincolnshire and will continue to do so after PGI status. If we can’t succeed in insisting that all Lincolnshire sausages have to be produced in Lincolnshire then we’re giving away one of our precious assets and a chance to build the local economy for generations to come and giving it to big businesses and intensive farmers of imported pork at the expense of our own farms, our own jobs and local economy. You may think why bother? Let them do what they like! But do you feel any pride when you see the Red Arrows fly over, do you enjoy the Wolds or feel any sense of belonging when you’ve been away and return to the view of the Lincoln Cathedral? Would you so readily give them away? If not, then let’s not give our food heritage away either. For more information on the Lincolnshire Sausage Association see website www.lincolnshiresausages.co.uk. Salmon steaks are very versatile, tasty and economical. This makes a lovely quick lunch or supper dish - healthy too! 1. Season the salmon steaks with lemon juice and salt and pepper. Heat a frying pan, pan fry the salmon steaks for 2-3 minutes on each side. 2. Melt the butter in a small saucepan, gently fry the spring onions without browning. Add the watercress, mix in the crème fraiche and warm through. 3. Divide the sauce between 4 plates, place a salmon steak on top and garnish with watercress and lemon wedges before serving.